Last year, the ALF Norrsken watch hit Kickstarter but unfortunately, it failed to meet its target. Samuel Petersson, the company founder, did not let that stop him, and he has brought the brand back to life with a new production partner, and a lower minimum order quantity. Will it succeed this time? We spent seven days with the watch to find out. The ALF Norrsken is a square watch, and that immediately sets it out from its predominantly circular peers. Based around the Miyota 8245 automatic movement (used by a lot of brands including SevenFriday), the watch comes in a white or blue face – we were sent the blue one to take a look at. The ALF Norrsken arrived in a really nice quality box, wrapped around a white watch cushion. The colours set off the watch nicely and made it really stand out. It may just be a box, but first impressions are important. Picking it up, it feels suitably solid (but not too heavy), and the quality of materials is clear. On the wrist it wears smaller than it looks thanks to its lack of lugs, and it balances nicely and will slip under most shirt sleeves. The watch will have a 2 year warranty, which is most generous, and shows the confidence ALF have in their baby. The case is made of 316L stainless steel, as is standard for most modern watches, and measures 40mm. Remember that a 40mm square watch is a very different beast to a 40mm round watch, and wears much larger. The case is 11.6mm deep but looks thicker because of the “slab-like” sides. Something like a Rolex Submariner is actually thicker but looks smaller as the bezel assembly and case-back disguise its depth. The ALF Norrsken makes a statement on the wrist for sure! 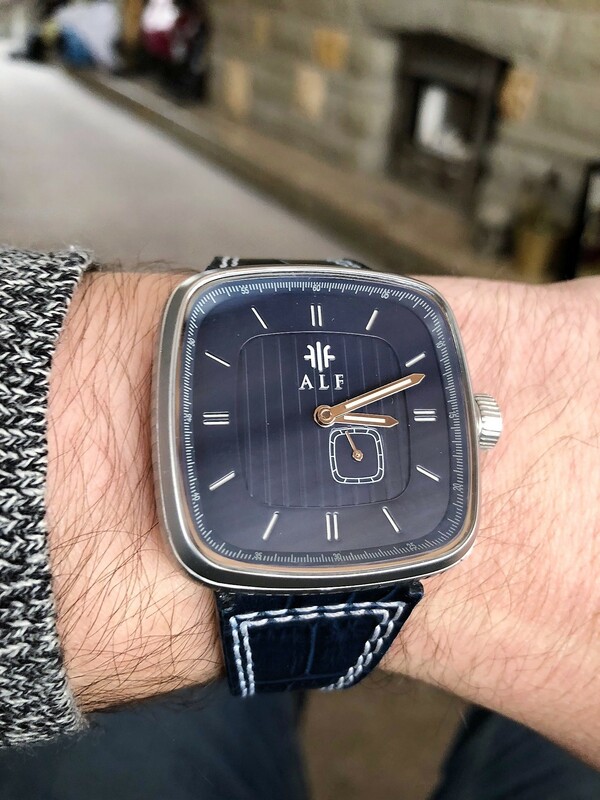 The dial and hands are the bits of the watch you are going to be looking at the most, and thankfully ALF have gone for a nice contrasting colour scheme. The dial is of a sandwich-type construction, with the indices cut out to reveal luminescent material beneath. The depth is not too great on the sandwich, so it is not clear at first how cleverly it is constructed. The centre part of the dial is lower, and ribbed – which makes it catch the light nicely. The green lume on the indices and hands is not very bright, but that’s not such a deal breaker with a dress watch as it is with a dive watch. The Miyota movement ALF have chosen has an offset subdial for the seconds hand which breaks up the face nicely, and because the second hand is so small you do not notice the “low-beat” movement at all. The applied ALF logo is a nice touch, too. We were less convinced about the minute track around the edge. It seemed redundant when, on a square watch, even if the minute hand were long enough to reach it at 12, 3, 6 and 9 O’clock it would not be possible to take an accurate read elsewhere. The other thing that our eyes found odd was the size of the hands. It is hard on a square watch to align them to the markers or edge of the dial as on a round watch, but they did feel a little short. The strap was the weakest point of the watch for us. It is not as padded as we would have liked and felt a little “cardboardy” – certainly nowhere near the high standards of the rest of the watch. Additionally, its extreme taper and short length meant we would be switching it out straight away if we bought the watch. Hopefully, this will be addressed in the final production models, perhaps as a stretch goal. The buckle is nicely made, with an engraved ALF logo. Unfortunately it would be unlikely to be an easy swap onto a new strap due to the large difference in size between watch case and buckle. Overall? We loved the ALF Norrsken – we would consider spending our own hard-earned cash on one, and there is no better recommendation. We were genuinely sad to have to package it up and hand it over to DHL. The ALF Norrsken is launching on Kickstarter in April from $299 – we’ll share the link on Facebook as soon as we have it, so please follow our Facebook page or sign up for the mailing list at ALF’s website to keep updated.